Is it ‘all in your head‘ and is your brain really responsible for starting those flushes? Some answers, and some help from bioidentical hormones. Hot flushes on average last for four or five years and occur in up to 80 percent of women – though those on a vegetarian diet seem to fare better – and perhaps surprisingly they also occur in men undergoing certain hormone treatments for prostate cancer. You may have also experienced them during pregnancy as the hormone levels fluctuate in a similar way to menopause. A team of researchers in the department of pathology at the University of Arizona College of Medicine believe they may have come closer to understanding the mechanism however. It seems it may be related to a group of brain cells known as KNDy neurons as a likely control switch of hot flushes. KNDy neurons are located in the hypothalamus, a portion of the brain controlling vital functions that also serves as the switchboard between the central nervous system and hormone signals. It seems these neurons play extremely important roles in how the body controls its energy resources, reproduction and temperature. When you have a flush, your skin gets hot and you can see the redness of the skin. This is the body’s attempt to get rid of heat, just like sweating. Except that if you were to measure your body’s core temperature at that point, you would find it is not even elevated – however much it may feel as if you are within a fiery furnace. This is just an experiment in progress, but we already know from other branches of science that our minds have a powerful effect on our bodies. Staying calm during a flush is not always easy, but it will make a difference as stress is a major trigger so taking a deep breath, and having a cold drink will help. Anything that calms you down and reduces your anxiety will also help, whether that is a relaxing bath, some deep breathing, yoga, listening to music or talking to a friend. Whatever you have tried and found effective is what you need to call on when a flush starts. The role of progesterone in helping to control flushes is not well acknowledged, but certainly is effective. 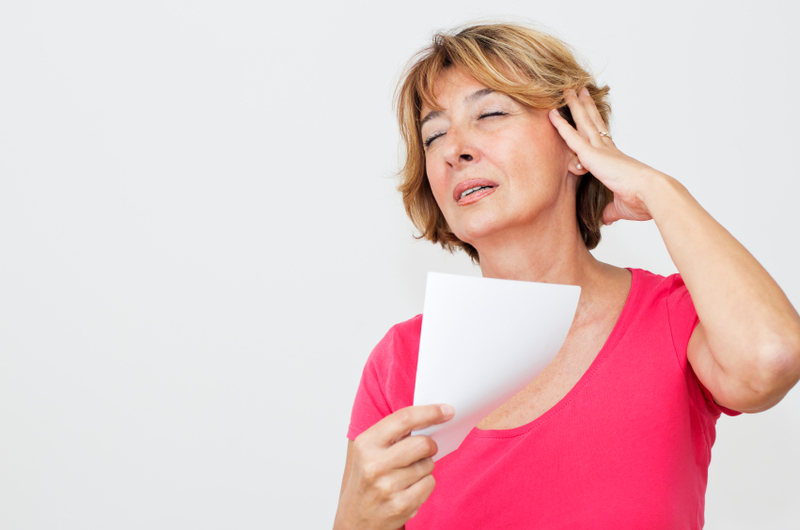 It is very common for the temperature control mechanism to be upset during menopause when the levels of both oestrogen and progesterone are falling. It seems as if it is the changes and fluctuations in the hormone levels, rather than the levels of the hormones themselves, that cause a disturbance which leads to a hot flush. As progesterone rebalances the hormones the symptoms come under control, but some women do find that they get fast relief from flushes by applying the cream during a flush or sweat to the inner wrist where the skin is thinner. It can also help to make the last application of the day immediately before going to bed as many have reported this has helped with sleep issues. If you that you have a specific trigger for your sweats, such as caffeine or anxiety, then take what steps you can to minimise exposure. Many women also find that calming exercises such as yoga or tai chi can make a difference to the severity of the flush or sweats. If progesterone cream alone isn’t enough, there is also the oral micronized form of progesterone (Prometrium). It must be taken at bedtime. It has numerous benefits, including an increase in deep sleep and respiration (decreases apnea) as well as a decrease in anxiety and addictive behaviors. Cream forms of progesterone have been proven in a randomized trial to decrease facial wrinkles and increase skin firmness. Although there were a lot of headlines several months ago that IV progesterone treatment failed to improve functional and mortality outcomes in traumatic brain injury patients, what was not mentioned was there was a significant benefit in female TBI patients (a 21% improvement in mortality and/or functionality). Four to five years? Mine have been going on for 11 years now and showing no sign of abating. I have tried all of the above suggestions and I use the Wellsprings cream which seems to help daytime, but night time? I have not slept (naturally/ ie: without help) . thru the night for over 15 years. My Dr. does not see any problem and any time I bring it up he says since it is not a “new” condition, it is not worth discussing. My physical and mental health is starting to shred.